Does Acupuncture Work? Do Acupuncture Needles hurt? Yes it is quite safe. 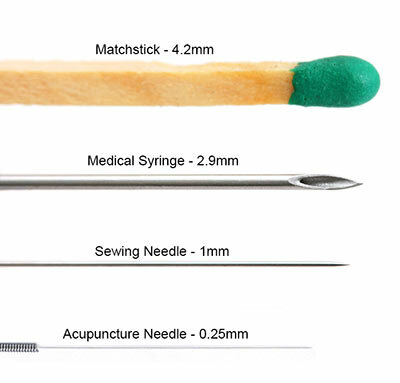 All the Acupuncture needles used are made of stainless steel, they are sterile and single use, so there are no concerns for infection or contamination. As Chinese Medicine is a regulated profession, we have a high standard of infection control and hygiene to uphold. This ensures your comfort and safety. But I’m Needle-phobic, can I have Acupuncture? Of course you can! Most people actually have a phobia of syringes, which are very different from Acupuncture needles. Syringes are hollow, thicker and designed to slice through the skin, therefore they hurt more. The Acupuncture needles I use are only .25mm thick (like a human hair). The needles are conically shaped, so they part the skin and muscles, they don’t slice. Many of my patients are needle phobic and they cope with Acupuncture just fine. Below you can see the relative size difference between an Acupuncture needle and a Syringe. Not technically, many people don’t even feel the needles going in, those that do, describe it as a tiny pinch. It is nothing like having an injection. The “pain” people associate with Acupuncture is the aching/heavy sensation around where the needle is inserted. This is called “De Qi” and is a very important part of the therapeutic process, it goes away once the needles are removed. I’ve found that people who are highly stressed and nervous tend to find the “De Qi” sensation more uncomfortable than others. In these cases I reduce the point stimulation and often the numbers of points used to ensure patient comfort. The more treatments you have the more you get used to this sensation, which enables you to relax more and even fall asleep. There is a big difference. Practitioners who “dry needle” have only done a short course (totalling about 6hrs). They are taught a very poor manipulation technique to try and loosen up the muscles. They claim it works on a different system but this is simply not true. They use our needles, and our acupuncture points, but cannot explain how it works when asked because they have no authentic Acupuncture training. The fact of the matter is they are manipulating your body, but without an understanding of how to do it correctly. They don’t mean harm, but you are putting yourself at risk and they are not as well trained as a Registered Qualified Acupuncturist, which is a government regulated profession. By calling it “dry needling” they can avoid regulation and therefore have no standards to adhere to. You should not let anyone other than a fully qualified Chinese Medicine practitioner insert needles into you. A fact sheet provided by the Acupuncture Association of Australia can be attained here. Is there anything I should do or not do after a treatment? There aren’t any strict rules, often if there are lifestyles changes needed to aid in your recovery, they will be discussed during the consultation. I always tell my patients to simply “listen to their body”. You can exercise and go out after a treatment, but if you find you’re feeling a bit lethargic then take it easy. Even though you are just lying there with needles in you, your body is still having a workout and does need time to rebalance itself. The human body has 365 commonly used Acupuncture points, along with hundreds less commonly used points. Depending on what is being treated will determine where the needles need to be inserted. In most cases though, points below the elbows and knees are selected, along with points on the back and abdomen. What is the Difference between Traditional Chinese Medicine and Acupuncture? There isn’t a difference, Acupuncture is one of the many branches of Traditional Chinese Medicine. There is also Chinese Herbal Medicine, Feng-Shui, Dao Yin, Qi Gong and Shi Liao just to name some of the more commonly known branches. All of these modalities fall under the heading of Traditional Chinese Medicine. It then comes down to their main training, mine is Acupuncture.